Following on from our recent guide to digital marketing, we are now homing in on one of the most vital channels within the digital industry, PPC. Pay-per-click advertising has the potential to be one of the most profitable investments a business can make in their marketing efforts when done correctly. You may have noticed that when you do a Google search, there are a number of search results with the word ‘ad’ next to them, these results are a part of the Google Ad network. PPC advertising is an effective way of getting your business to appear on the first page of Google for specific keywords and can even get you to the top of search engine results through the use of the ad network. Although this is dependent on a variety of different factors, including ad spend, quality score, landing page experience and the overall reliability of your website etc. The reason it is called pay-per-click advertising is that you’ll only have to pay a fee to Google when your ads are clicked by a user. Therefore, if nobody was to click on your ad, you wouldn’t have to pay anything. What Are The Benefits of Pay-Per-Click? There are numerous advantages of PPC advertising, some of which are that you can monitor the progress of your campaign whenever you wish, you also have full control of your budget and can target your ads to a specific demographic. We live in a world that is extremely data-driven, Google Ads provides you with an almost overwhelming amount of data, all of which can be divulged to improve the overall quality of your ads and save money on your cost-per-click. Interpretation of data is vital when it comes to PPC as it can allow you to spot keywords that are costing you a lot of money but aren’t leading to conversions. As you can manually set your daily budget as well as the money you are prepared to spend on each keyword, you have complete control of your ad spend. This means that if you wish to put your ads on hold for a couple of months in order to organise your finances, Google Ads gives you the freedom to do such a thing. This is especially useful for businesses that are more popular during certain periods of the year, eg. gardeners may wish to pause their Google Ads campaign over the winter months. An extremely useful tool, geotargeting allows you to specifically home-in on a particular area in which you’d like your ads to be displayed. You will typically want to target the exact towns/cities you operate in, you can also set a radius around the areas in order to maximise coverage. This ensures that you augment the visibility of your ads within your target demographic. One of the first and most important steps of creating your PPC campaign is to carry out your initial keyword research. 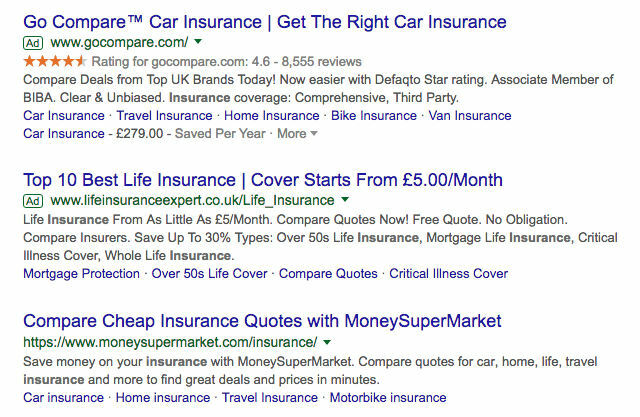 Allowing you to pick out the keywords that customers will search on Google in order for your ad to be displayed. You will then be provided with an array of search data, including average monthly search volume, the recommended minimum and maximum cost-per-click (CPC) and the competitiveness of the keywords. All of this data can then be used at your own interpretation to determine whether or not the keyword is worth adding to your campaign. Ad groups are the locations in which a specific set of keywords and ads are kept. You would typically organise your ad groups by a common theme, typically broken down into the products or services that you wish to promote. For example, if you were a plumber, you may wish to have an ad group for boiler servicing and a separate ad group for central heating installations etc. Within those ad groups, you will add the keywords that you wish to target following on from your keyword research. Bid adjustments give you the opportunity to really home-in on your target audience. Whether you wish to adjust the schedule in which your ads are displayed, as perhaps your ads don’t perform well between 01:00 am – 06:00 am, therefore you can stop your ads from appearing during these hours. Alternatively, you have noticed that the majority of your audience is using mobile devices, you may wish to adjust your bidding by +20% for mobile users and -20% for tablet users. The video above from Google goes into more detail as to how bid adjustments can benefit your PPC campaign. At first, you may be overwhelmed with the numerous bid methods/strategies available when it comes to setting up your Google Ads account. With each one offering its own unique way of utilising your ad spend for an array of different purposes. Whether it’s to maximise the amount of traffic coming to your website or to enhance the number of conversions from your ads. Manual cost-per-click allows you to choose the maximum amount of money that you would be willing to pay for your ads to be displayed for certain keywords. You start by setting the maximum bid for your ad group, this is known as the ‘default bid’. Manual CPC is useful as it gives you the freedom to pick and choose which keywords/ad groups are worth investing more money into. Using this bid method allows Google to automatically make adjustments to your bids to maximise the number of clicks your ads receive. This option is a popular choice if you are struggling to reach your daily spend budget and are hoping to maximise the amount of traffic coming through to your website. Similar to the maximise clicks method, maximise conversions will automatically adjust your bids in order to maximise the number of conversions from your ads. Using advanced machine learning to automatically optimise and tailor bids for each and every auction. Quality score is the ranking system that Google uses to determine the overall quality of an ad. Incorporating numerous factors, such as the landing page that the ad is linking to, the relevancy of the keywords you are targeting, the written content within the ad as well as the budget for your ads. If you would like to learn more about PPC or are potentially interested in enquiring about our pay-per-click services, you can speak to our friendly team on 01455 367 100 or you can fill out our online enquiry form today.